I have done this twice already in the past few years, so for 11 weird things about me, visit here and here. 5. Let each person know they’ve been tagged by leaving a comment on their site. 1. The smell of the air just after it's rained - which is great for two reasons (nice, fresh and clean, and bloody hell, it's RAINED). 2. A big cup of tea around 9pm - don't know why, but around then I actually crave tea, and that cuppa is the best one of the whole day. 4. Hugs from my hubby, kids and friends. Especially from my gorgeous 16-year-old Dotter, who cries "I miss mah mummeh!" and grabs me :) Actually just doing stuff like op shopping or watching TV or knitting with her is the best - we are really close friends, and I love that so much. 6. Casting on a new knitting project, and knitting with a British murder mystery on the telly! 7. Playing Mah Jong, using my antique bone & bamboo set which smells all musty and wonderful. 8. Painting and drawing when I'm 'in the zone' (right-brained) and it's going well. 9. Belly dancing and moving to music. A fantastic new addition to my life. 10. Time alone, often in silence, without demands. I'm just going to tag a few friends who haven't done this yet - Honeygo Beasley, and Penny-in-Austria. Edited To Add (ETA) : Yeah Roxie, real Mah Jong is a complicated game for 2 to 4 players relying on both skill and luck, and with an ancient history ... nothing to do with the basic 'solitaire' matching game you get online. The closest thing to it in cards is Gin Rummy. Yay, you're making three tams! Well, one tam of three. The smell after rain is awesome. And we've actually got some of it happening this arvo! Huzzah. The real game of mah jong isn't anyting like those on-line solitaiare games, is it? Your vintage set is delightful! I can totally relate to your list. 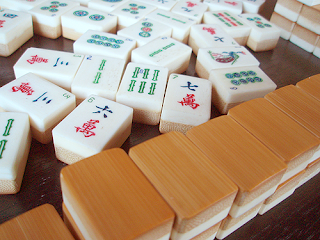 Except I can't play mah-jong, but can imagine how cool it is to use your vintage set. The after rain smell is the best. And while hugs in general make me happy, hugs from my girls are the best. I have never played mah jong in real life only online. I have often admired the sets and wanted to own one but wasn't sure I'd find anyone (let alone 3 other anyones) to play with. And I'm glad you enjoy the drawing. You are so good at it. Dang, I wish I'd know you when I lived in Canberra - I was taught mahjong at age 4 and have very few people to play it with in recent yearss!